This section makes very clear that training programs requiring therapy or disclosure of sensitive personal information as part of the training process must take steps to protect students. Also made more explicit was the prohibition against sexual relationships by psychologists and the students and supervisees “in their department, agency, or training center,” although these terms are somewhat vague. The training of students to become psychologists is a multi-layered issue, as it is not only possible to harm those who come to us for training, but also to harm people we never see. By acting in insensitive and power-abusing ways, we are teaching others to act in the same ways. When they go out into the world to practice, they are likely to do the same. I recall a study that showed that therapists who had engaged in sexual relationships with their clients were more likely to have gone to training programs where faculty had dual role and sexual relationships with students. 15/3(c) Individuals, corporations, partnerships and associations may employ practicum students, interns or postdoctoral candidates seeking to fulfill educational requirements or the professional experience requirements needed to qualify for a license as a clinical psychologist to assist in the rendering of services, provided that such employees function under the direct supervision, order, control and full professional responsibility of a licensed clinical psychologist in the corporation, partnership or association. 15/3 Section 4. Application of Act. (a) Nothing in this Act shall be construed to limit the activities of and services of a student, intern or resident in psychology seeking to fulfill educational requirements or the experience requirements in order to qualify for a license under this Act… provided that such activities and services are under the direct supervision, order, control and full professional responsibility of a licensed clinical psychologist and provided that such student, intern, or resident be designated by a title “intern” or “resident” or other designation of trainee status. (15/10. Qualifications of applicants – Examination) Section 10. A year of supervised experience is defined as not less than 1,750 hours obtained in not less than 50 weeks based on 35 hours per week for full-time work experience. Full-time supervised experience will be counted only if it is obtained in a single setting for a minimum of 6 months. Part-time and internship experience will be counted only if it is 18 hours or more a week for a minimum of 9 months and is in a single setting. The internship experience required under Section 10, subsection 3(a) and 3(b) of this Act shall be minimum of 1,750 hours completed within 24 months. While you might hear stories that you might not believe, I know a doctor who took the test and was given a set of ear plugs with the test booklet because the hotel hosting the test had a band warming up down the hall from the testing room. Likewise, a doctor in my practice couldn’t take the exam because, even though he had all forms and fees accounted for prior to the deadline date, the psychologist committee reviewing applications didn’t have time to review his file and so he had not been approved to take the exam. Koocher and Keith-Spiegel say quite clearly that to administer this test in this manner is unethical. Further, they raise concerns about the test items themselves. Many are poorly worded, and Keith-Spiegel and Koocher report of actual errors on the test that the company did not want to correct. While the company may make every effort to prevent this, test takers do not receive feedback on their specific questions and scores. Thus, testing errors are hard to discover. 175 psychologists who had recently written letters of recommendation generally claimed in their responses that they would disclose information about some negative characteristics. In contrast, 116 psychologists who had recently read letters of recommendation indicated in their responses that negative characteristics are infrequently described in letters of recommendation. The survey by Rodolfa and colleagues (1999) indicated that letters of recommendation ranked 8th among 38 potential criteria considered by training directors. They noted that the Ethical Principles require psychologists to avoid false or deceptive statements, to be accurate and objective in teaching, and to objectively assess student and supervisee performance. Thus, writing “glowing” rec letters for people who are not “glowing” is unethical on a number of grounds, and they recommend the updated Ethics Code specifically deal with this (the update did not deal with this). Finally, they note that integrity also entails a willingness to be honest about human limitations and personal problems. As professionals, our ability to find solutions to problems is dependent on our willingness to first note them and talk about them candidly. If we won’t, we hurt ourselves and others. They suggest that technical errors be seen as forgivable and unavoidable in training, but “normative errors,” or ones that violate basic expectations of the profession regarding client care and professional behavior, be seen as “real” errors that require moral evaluation. They also give examples of supervisors who abuse their position of power, or at least are insensitive to their effect on others. They also recommend that routine feedback be built into any supervision relationship, with discussions of clients, supervisee needs, and feedback on the supervisee’s performance. As with anything, document, document, document. I’d recommend that dates that the student’s performance was discussed and the feedback offered, clients discussed, and anything else you need to document what happened. Likewise, document feedback offered to you, and if there are discrepancies between what supervisors tell you and what they tell the program, you have notes to fall back on. Recommendation letters present a special issue. You are agreeing to write a letter of recommendation, and if you have doubts about the person, you are then failing to honor your agreement with them. Likewise, if you agree to send it by the deadline and don’t, this hurts the student. Research work also requires adherence to ethical principles on research and modeling that behavior for others to follow. 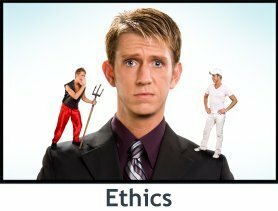 Every ethical infraction they present is two infractions really; 1) whatever they did that was unethical, and 2) the harm that resulted to the student and to others, as well as the model set for the student to “grow up” and do the same. As to employees, when they act on your behalf in unethical ways, you are responsible for their behavior. There will of course be times when they are outside their boundaries of competence, and should know who to turn the matter over to in order for the client, research participant, or student to be best served. Issues though such as allowing the billing clerk to read your therapy notes, allowing the receptionist to leave messages from clients in plain view on the desk by the waiting room… are issues you must watch for. Sexual or Gender Based Harassment is especially egregious. Koocher and Kieth-Spiegel give definitions from the EEOC on sexual harassment, as well as clear examples of it. They go further to talk about gender discrimination in class, in therapy, and in hiring and recommendation practices. The “Glass Ceiling” and “hostile work environment” in business settings can translate to academic settings as well.